Mel Stottlemyre, the ace of the Yankees pitching staff in the late 1960s who went on to be the pitching coach of the Mets' 1986 World Championship team, and the Yankees 1990s dynasty, passed away on Sunday at the age of 77. 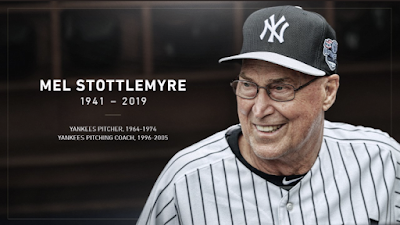 Yankees Managing General Partner Hal Steinbrenner said in a statement on behalf of the Yankees, “Beyond his tremendous accomplishments as a player and coach, Mel Stottlemyre was beloved for his class, dignity and fighting spirit. His contributions to different eras in our history guided us through difficult times and brought us some of our greatest all-time success. As a result, Mel’s popularity transcended generations, all of whom thought of him as their own. His plaque in Monument Park will forever serve to celebrate the significance of his legacy. Stottlemyre was a five-time All Star in his time pitching for the Yankees from 1964 through 1974. His record was 164-139 with a 2.97 ERA. He did not win a championship as a player since, although he did pitch in the 1964 World Series as a rookie against the St. Louis Cardinals, who beat the Yankees in seven games. In 1984, Stottlemyre became the pitching coach of the Mets, just in time for the arrival of Doc Gooden's rookie season and the resurgence of that franchise. He guided an outstanding rotation, which included Gooden, Bob Ojeda, Sid Fernandez, Ron Darling, and featured Roger McDowell and Jesse Orosco coming out of the bullpen. The Mets won the 1986 World Series championship over the Boston Red Sox in seven games. Stottlemyre was fired by the Mets at the end of the 1993 season, and then was the Houston Astros pitching coach the next two seasons. In 1996, he came back home to the Yankees to be their pitching coach, part of new manager Joe Torre's staff. The Yankees won the World Series that year, and then three in a row from 1998 through 2000. The Yankees' rotation in that dynasty featured Andy Pettite, David Cone, Jimmy Key, David Wells, Roger Clemens, and Orlando "El Duque" Hernandez, with the greatest closer ever, Mariano Rivera, coming in from the bullpen. Stottlemyre was with the Yankees until the 2005 season, and was replaced by another legend from his playing days, Ron Guidry. After a couple of years away from the game, Stottlemyre's last job in baseball was as the Seattle Mariners pitching coach in 2008.